PC board dimensions: 2.23" x 0.62"
This small FM transmitter can transmit your voice to any FM receiver within range. It has good stability and an adjustable transmitting frequency from approximately 88 to 95 MHZ. 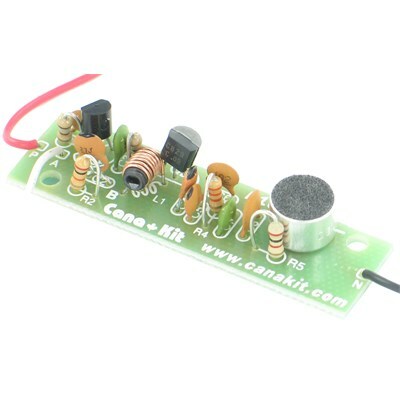 It operates with a single 1.5V battery and incorporates a sensitive microphone mounted right on the board. Due to its small size you will find many applications for it.